As most experienced cannabis growers and horticulture experts are aware, the health and vitality of plants is essential in all stages of growth. Paying attention to every variable will help ensure a bountiful harvest. These notions of plant health are crucially important to maintain during “transitional periods” of crops as well. These are those times when plants are stressed due to infrastructural and climactic changes induced by cultivators themselves. Transitions are necessary in every cannabis plant’s life, for both indoor and outdoor cultivation operations. To this end, they must be done, even though these changes in growing conditions and environment are taxing for plants. Perhaps the most stressful transitional period for outdoor cannabis plants is the move from an indoor room to the exposures of the outdoors. The first thing that cannabis and hemp growers should remember when transitioning full season outdoor plants from the indoors is that sunlight is far stronger than artificial lighting. Therefore, it is essential that cannabis growers “harden-off” plants as they slowly expose them to the sunlight. Hardening-off is accomplished by introducing sunlight to the plants through weakened UV rays in a shaded environment. Often, gardeners create these shaded areas out of a PVC hoop-house construct that is covered in “shade cloth.” This cloth is simply some mesh material that allows for simultaneous air flow and UV protection. Hardening-off is accomplished after outdoor cannabis plants have been comfortably in the shade for 7-10 days. At this point, they are ready for full sun. This task is accomplished by simply carrying the cannabis plants outside in the morning and back inside at night. With this method, one ensures that plants don’t experience the cold temperatures of the night time. The same can be said about adverse weather conditions. Furthermore, it extends the hours of “daylight” to ensure that full season outdoor plants don’t prematurely flower. Finally, this method is attractive because it doesn’t require the construction of any additional infrastructure. 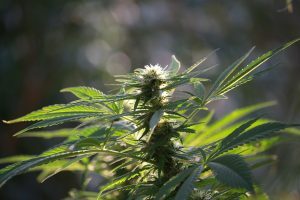 To this end, cannabis plants are simply placed in the sunlight. There are a few downsides to considering when deciding to manually move cannabis plants twice a day. To begin with, one has to be present twice a day to accomplish the task. Secondly, if the indoor grow room in question is located in a basement or other difficult to reach area, gardeners are faced with a number of obstacles to dodge in carrying the plants. This notion sometimes makes this remedial chore more complex than is ideal. Finally, if plants are in larger pots (above 1 gallon), carrying them twice a day becomes an extremely burdensome task. One of the most popular ways that growers utilize to ease the transitional period of cannabis and hemp plants from indoor to outdoors is by using greenhouses. With these structures, cold spring daytime temperatures are greatly heightened as walls trap heat within the greenhouse. Greenhouses are ideal for growers that have large number of plants, large pots, or simply don’t want to carry plants inside and outside twice a day. These set-ups work great for traditional outdoor gardeners who want to simply get their plants outside early. They can also be used throughout an entire grow season to provide better security and environmental control. When deciding whether or not to use a greenhouse to aid in one’s transition from indoors to outdoors in the springtime, there are some important concerns to bear. In order to keep the light cycle in the vegetative phase of a plant’s life growers must hang supplemental lighting inside the greenhouse. These lights can range from some simple fluorescents to high-powered DE HPS systems. One’s choice in supplemental lighting will depend on the amount of average sunlight provided in a given environment. Most importantly, supplemental lighting is used as an aid to simply extend the hours of “daylight” for vegetative growth. Finally, supplemental lighting will make one’s greenhouse “glow” during the nighttime hours. So, if neighbors are a concern it will need to be covered with a blackout tarp as not to attract attention or contribute to light pollution. This last option for getting outdoor cannabis plants outside early may seem rather unconventional to the average grower. But, the method’s remarkable ingenuity and practicality makes it hard to ignore. Furthermore, this method is far cheaper than a greenhouse kit. It can also usually be done with materials that most individuals have at home. With a standard carport kit, horticulturalists can literally “wheel” their cannabis plants in and out of the structure on a trailer. These trailers can be standard trailers used for your standard hauling or can be custom built for the task. Even more, they allow cannabis cultivators to grow full season outdoor plants in large pots, while protected at night by a shelter that can be moved easily. Even more, carports are rather incognito for noisy neighbors, etc. Considerations for using the carport and trailer methodology should be based largely on the materials one has at hand vs what they must purchase. For example, if a grower already owns a trailer for hauling things such as kayaks, as well as the required carport—it’s kind of a no brainer. 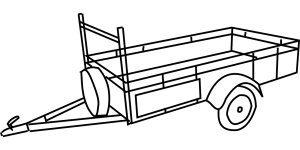 Even more, if a cultivator owns a spare vehicle to pull the trailer in and out without manual labor, the option becomes really attractive. Finally, the same considerations must be made with supplemental lighting and heat as seen with greenhouses, accept carports don’t leak light at nighttime like the transparent walls of greenhouses.